The Kaiser Family Foundation/Health Research Educational Trust has released its 2016 Employer Health Benefits Survey. The survey covers almost 1,900 private and public (non-federal) employers. The results show Obamacare has not reduced premiums, which have increased by one-fifth for family plans since 2011. These plans were first available in 2005, and their increased adoption over the years corresponds with an immediate slowdown in the growth rate of employer-based benefits. 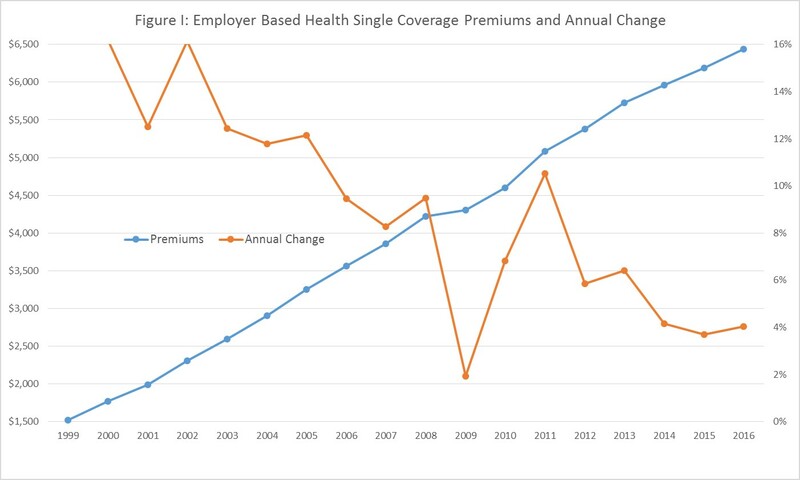 In real terms (adjusted for changes in the Consumer Price Index), annual premium increases dropped from double digits in the early 2000s to single digits after 2005 and bottoming out at an increase in premium of just two percent in 2009. There was an immediate jump of 11 percent in 2011, Obamacare’s first year. Since then, both High Deductible Health Plans and the burden of Obamacare have continued to grow. This struggle has resulted in mid-single digit premium growth (Figure I). Source: Author’s calculations from 2016 Employer Benefits Survey (Kaiser Family Foundation, 2016). Adjusted by Consumer Price Index (2016=100).